The eastern end of Parnell Street, having remained comparatively undeveloped, is now home to a thriving immigrant community. 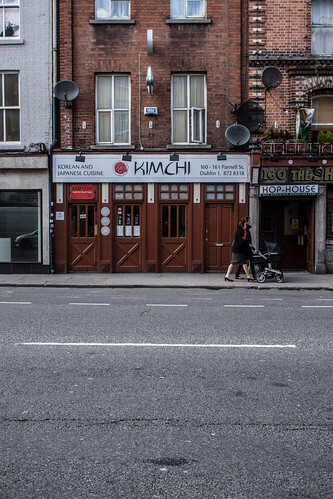 Most notably, a plethora of authentic Chinese and Korean restaurants have lent the east side the reputation of being Dublin's "Chinatown". There is also a significant presence of African and East and Central European businesses at the eastern end. Parnell Street is named after Charles Stewart Parnell (1846–1891); Dublin Corporation adopted a resolution after his death to rename Great Britain Street. The Rotunda Hospital, the Ambassador Theatre and the Gate Theatre are on Parnell Street itself while the Garden of Remembrance, the Dublin Writers Museum and the Hugh Lane Gallery are on the north side of the Parnell Square. The James Joyce Centre is immediately off Parnell Street on North Great Georges Street, while located just off the eastern end is the historic Mountjoy Square.